The plants are entirely submerged near the bank of lake or pond. 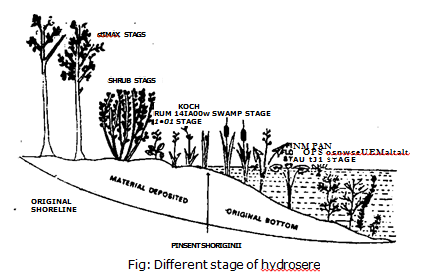 These are the pioneers of the hydrosere. They include several flowering plants like Hydrilla, Potamogeton etc. These plants grow at various depths. They are mostly rooted in the muddy or sandy bottom. Light can penetrate there. There are death and decay of the submerged plants. Thus material is collected at the bottom of the lake. It becomes. shallow. Therefore, the habitat becomes unsuitable for the submerged plants. The water depth of lake becomes six to eight feet. Now it is occupied by floating plants. Most of these plants have rhizomes. They grow from rhizome. Some of these plants are Nymphaea Nehtmbium. Nvmphoides and Eichornia. Nymphaea and EiehornM have broad leaves. They cover the water surface. It cuts off light for the submerged plants. These plants migrate to deeper waters or died. Soil and dead plants accumulate in the lake. Now the habitat becomes unfit for floating plants. The water has become shallow. Now it has become suitable for the partly submerged plants. Their leaves are raised above the water surface. Some common plants are Saginaria, Typha Sperganium, Polygonum etc. These plants give shade to the surface of the water. They retain the sedimentary material. It builds up the lake banks. Thus the water depth is further decreased. Now the lake has become very shallow. Thus the sedges and grasses dominate the area. Some of these are Carex, juncus , Scirpuss etc. They develop rhizomes and slender roots. These plants accumulate plant debris and soil. They transpire a large amount of water. Therefore, the habitat becomes dry. It becomes unsuitable for sedge meadow plants. Now certain ‘ species of shrubs and trees appear. They can tolerate waterlogged soil conditions. Species of Sally and Pupa/us grow there. These plants produce shade. They also lower the water table by transpiration. They also build up the soil. Thus the habitat becomes . unfavorable for the woodland stage. Now soil is enriched with minerals. The water table has also gone down. These conditions are favorable for other plants. Flydrophytes are replaced by mesophytes. Ultimately a stable community (climax) is formed. It is primarily controlled by climatic conditions. This stage is dominated by annual trees.